WOW, now that was one emotionally draining episode! With all of the rumors flying around about other characters, I didn't see this one coming until the final minutes of the episode. 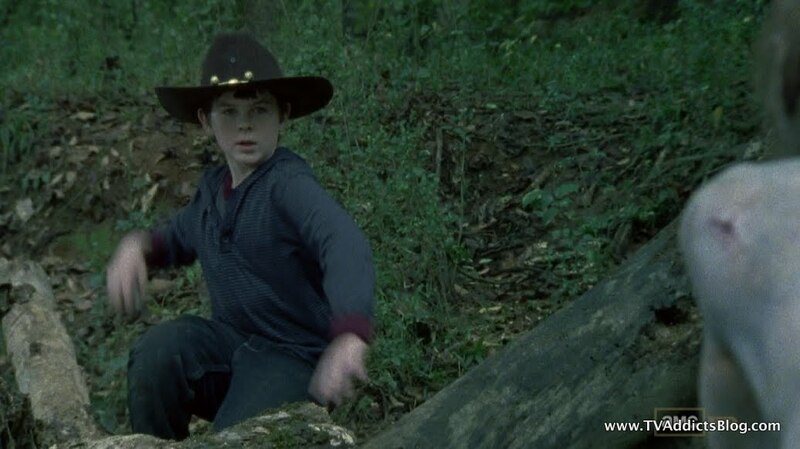 And truthfully, I think most of us were hoping Carl would be at the other end of a gun by the end of the episode! Anyway, I'm short for time today so let's get right into the brief recap! So, basically the whole episode dealt with a common theme for the season. Being civilized in the wake of a zombie apocalypse vs. survival of the fittest. Dale, as always, took up the argument of keeping some form of humanity going in this new world. Everyone else, basically wanted to turn their head and let be done what needs to be done. Meanwhile, Carl plays the catalyst for events taking some detours along the way. Rick was pretty determined to side with Shane on the whole “killing Randall” issue. He’s a threat to keep alive. If they kept him alive they’d have to babysit him and make sure he didn’t turn on them or run to get his friends. But, Dale brought up his case and was given until sundown to talk to everyone. And every single one of them shot him down. Andrea, Hershel, Glenn, Daryl, everyone! Well, actually Daryl didn’t care either way. He thinks the group is broken and is out for himself. But what was nice was that Shane and Dale had a pretty civilized conversation. Even Andrea was being nice to Dale. We should have known then that Dale was facing his expiration. But yeah Shane and Dale agreed that they would never see eye to eye but Shane agreed to keep his mouth shut of everyone sided with him. They didn’t. So while Dale’s pursuit of righteousness was going on, Carl was feeling a bit unimportant and wanting to get in on the action. 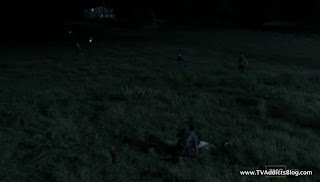 We see him going behind Shane and Andrea’s back to taunt their prisoner. “Poking the bear” as Greg Nicotero (director of episode and zombie make-up guy) referred to it on TALKING DEAD last night. 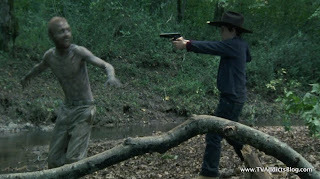 Shane flipped out on Carl. Then Carl started telling Caroline there was no God and Sophia is just gone. So Caroline starts flipping out about Carl. Rick has a talking to Carl but it does no good. 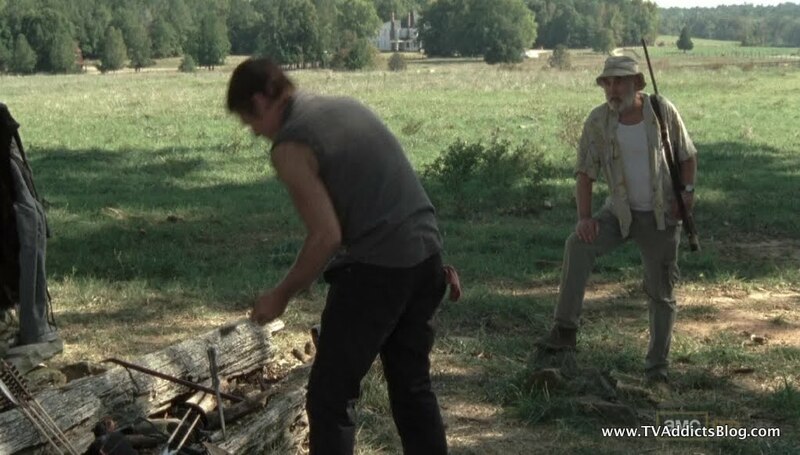 Then he goes to try and ride Daryl’s motorcycle but he finds something much more interesting. A nice gun. Sweeet. He goes wandering in the woods and finds a walker whose feet are stuck in the mud. OH BOY. What does he do? He starts “poking the bear” again. Throwing rocks at the thing. And then he gets closer with the gun…and of course the walker breaks free and goes after him. SERIOUSLY CARL!?!?! 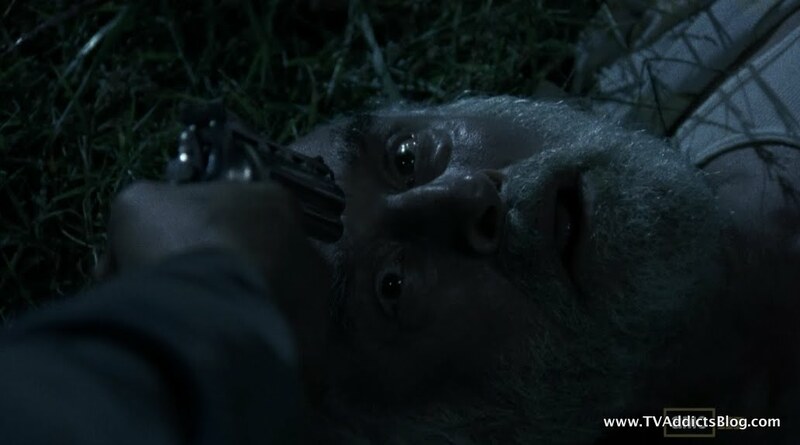 I mean, we spent episodes and episodes invested on Hershel, Shane, whoever doing whatever they can to save him. And now he’s being this daredevil kid? Sure, he can’t be all to blame. 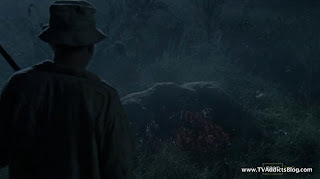 He is growing up in this world without rules, and he is surrounded by men and some women killing to protect the group. I guess he’s feeling left out. But, he certainly can’t be forgiven for the incidents he set up at the end of the episode. And something tells me he won’t forgive himself. 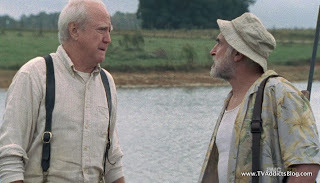 In the midst of all this stuff, Hershel and Glenn have a nice discussion. 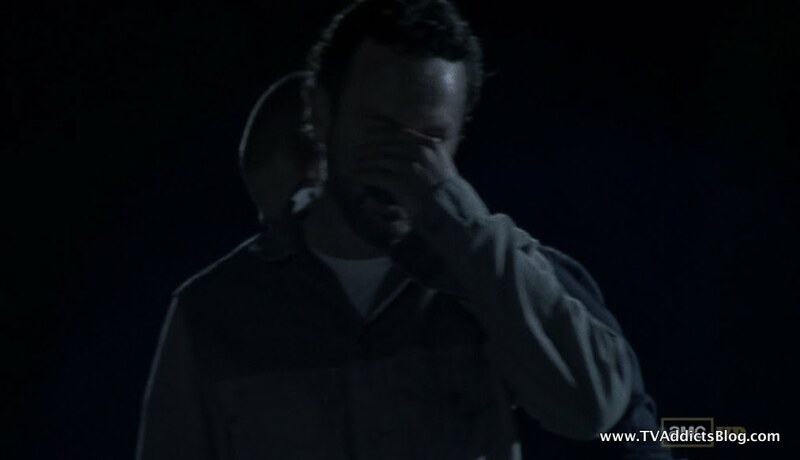 Hershel asked about Glenn’s origins and seemed to come to terms with the fact that he and Maggie love each other. 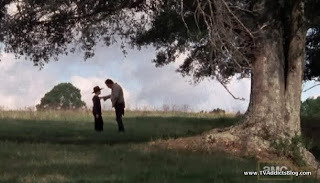 He passed down the family heirloom pocket watch to the first man he ever thought deserved his daughter. Awwww! And then the vote happen. Dale put up a good case but he was extremely outnumbered. Who knows if it was Andrea’s sympathy for Dale or if she was serious, but she ended up agreeing with Dale in the end that they should find another way. Dale was worried what it would do to the group when they become cold blooded killers. 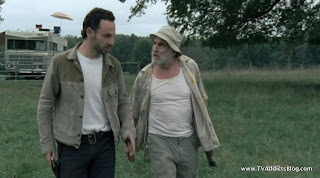 Rick was as close as he could have gotten to finding out, but of course crazy Carl shows up egging his father on. “Do it Dad! Do it!” DAMMIT CARL!!! 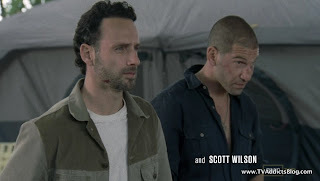 So anyway, Shane flips out again, and Rick loses his edge and decides they’re going to keep him alive for now. Now, I didn’t see it but apparently, Daryl was going to take matters into his own hands. He had a knife and was just going to kill Randall when everyone else was gone. But then something else happened. Dale was so frustrated with the vote, he didn’t want to be a part of things. He went for a walk. And of course, he stumbled upon a mangled cow. A walker had gotten to it. And when Dale turned around? Yep, there’s Carl’s walker!!! DAMMIT CARL!!!!! Dale screamed, everyone heard and ran for him. But it was too late. 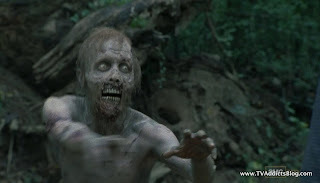 The walker had sliced open Dale’s stomach and guts were exiting all over the place. 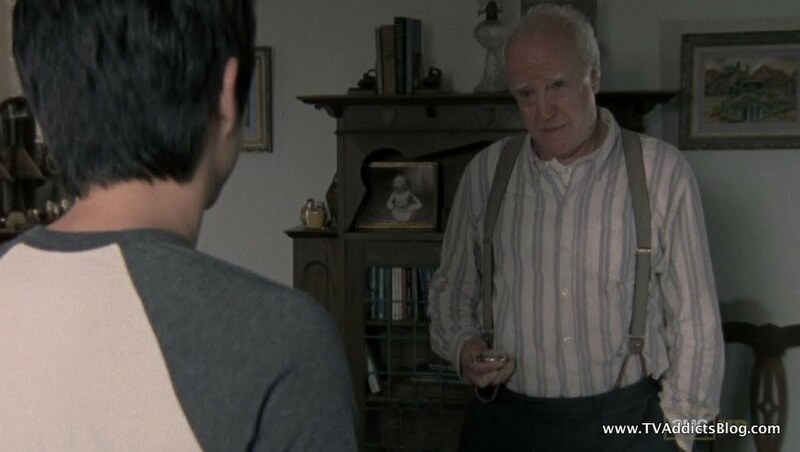 Hershel knew it was a lost cause right when he saw him. But, he was suffering and suffering badly. 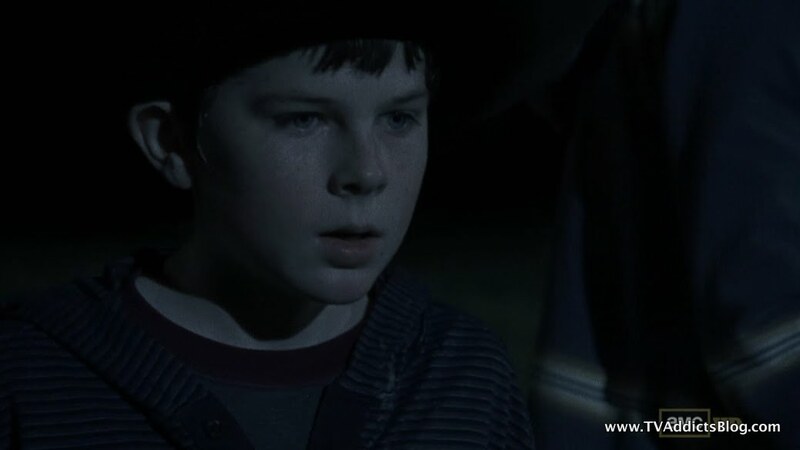 Carl, witnessed the scene and saw the walker that caused it and knew immediately what he had done. So we returned to classic Carl crying face. Andrea returned to seeing Dale as a father figure and was by his side weeping. 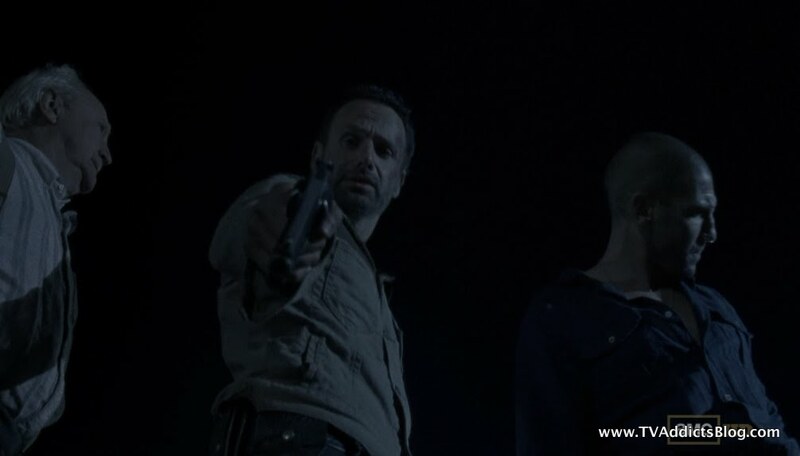 Rick, had his gun ready and knew what he had to do. He had done it with Sophia but she had already turned. 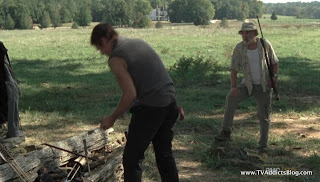 Dale wasn’t even infected (yet), he was just dying from the very very bad cut. Rick, pointed the gun, but god…did you see Dale’s face? Who could shoot that guy!?!? I’ll admit it, I lost it in these final moments. They were so well done, but as I said…emotionally draining. 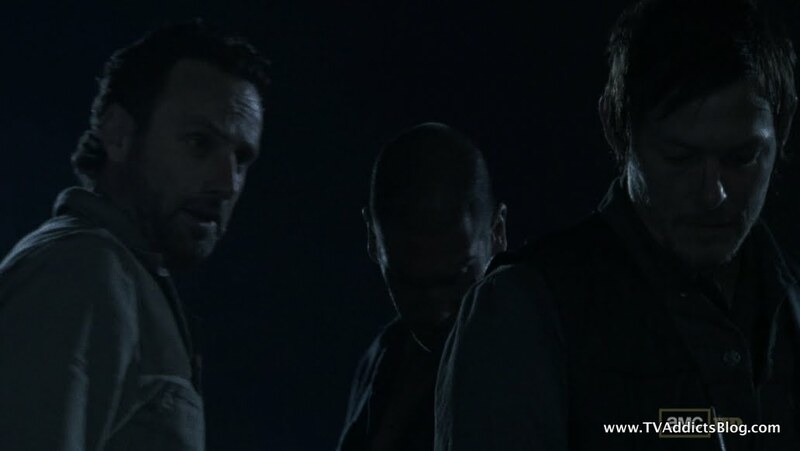 Daryl, assuming his new role for the group, relieved Rick from this horrible duty and too the gun. Pointed it at Dale. 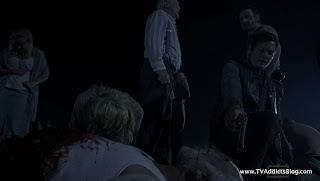 Apparently, Dale leaned in to the gun knowing what needed to be done (again…TALKING DEAD commentary). Daryl uttered 2 words…”sorry brother”…and then pulled the trigger. WOW….RIP Dale. You will be missed. I guess, I always felt Dale was inevitably going to be taken out of the equation. But, it’s still rough to see it happen. The question is, will someone rise up and take up his flag to be the “hope for humanity”? 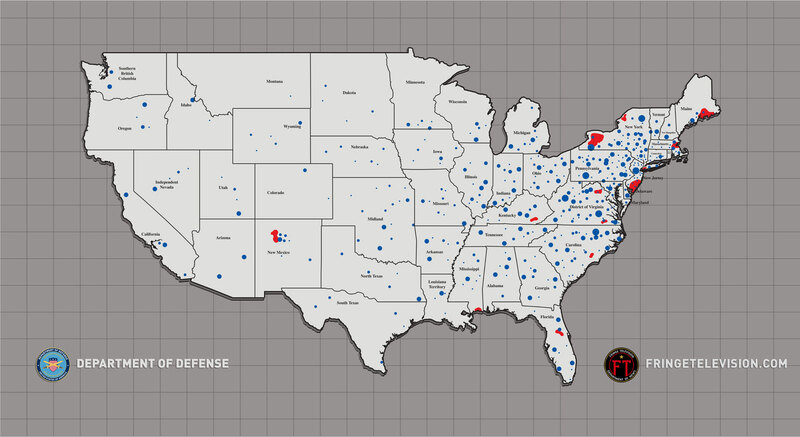 Something tells me we’re just scratching the surface on the issue so I think someone will. The question will be who!? Anyway, solid episode last night! Looking forward to the final 2 of the season! A note on Alcatraz tonight. Apparently, they’re skipping the episode that was meant to air last week to air the 2 hour episode that was meant to air together tonight. Next week, they’ll return to the episode that was supposed to air previously. Hopefully, that won’t mess up the mythology reveals too much! Anyway, hope you enjoyed my ramblings and I’ll see you next week! OMG! My mouth was hanging open when Dale died ! I did notice Dale lifting his head toward that gun once Daryl had it as well, not sure what commentary you are talking about though. 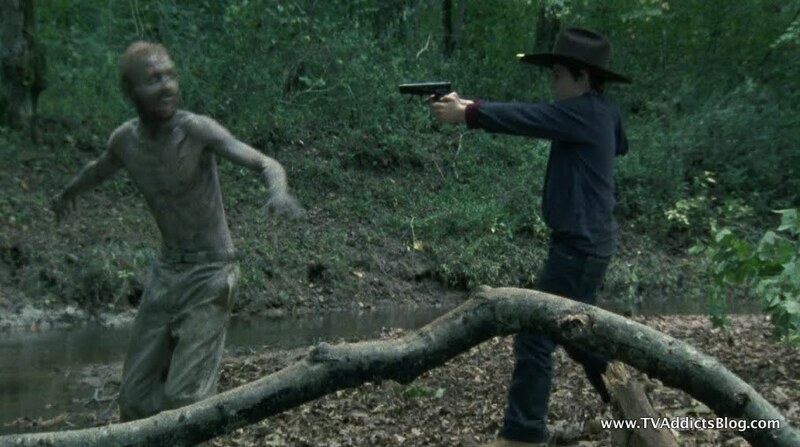 He didn't seem to left his head towards Rick when he had the gun though. I think Rick feels that he has to do something that would be viewed as the right thing by Shane to get him to back off and that it is a core reason Rick feels that he has to kill Randall. 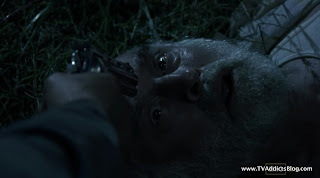 I'm sure he thinks randall could be a threat but killing him is to prove someting to Shane. You are so right - I did not see Dale's death coming and def should have since they - especially Andrea - were being so nice! LOL But I never felt this character would be killed as he was the moral compass of the group - fi gured he'd be safe for quite awhile. Interestingly - we have another instance where Rick knows what has to be done and yet can't seem to do it. 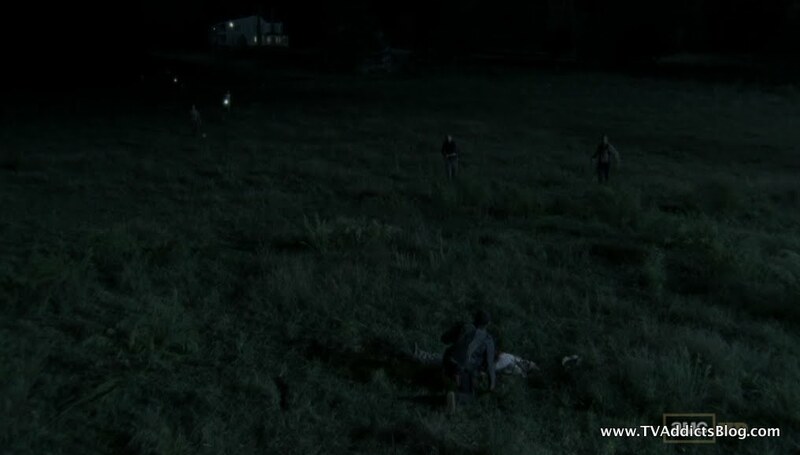 Only the little girl stands out with Rick being able to pull the trigger - and that was because she was an immediate threat. They need to give little Carl some serious chores and keep him busy. LOL But I see what they were doing - using an innocent child to highlight just how much what is considered good and bad behavior has changed. And how everything that the kid has seen has changed his perspectives too. It brings up the question - it's a new world out there so how much, as a parent, do you change how you raise your child? Where normally he's too young to be handling guns and things - do you let him now ?? What a great ep ! SO sad, but very exciting where they are going. I'll try to watch Alcatraz - but only was able to watch TWD cause they repeated it as Im on vaca. We actually got some snow overnight in Va ! Going snow tubing today. Great recap as always Mike ! I'm sure I'll check back in. Wow - this whole comments page looks dfferent today ! See you got your screenshots back too ! the commentary I was referring to was from Greg Nicotero on "TALKING DEAD" last night. He pointed out that Dale did lean in for the kill. So he accepted it. I didn't notice it when I was watching. Interesting point that he didn't lean in for Rick though. I agree, Rick does feel like he has something to prove to Shane. But I think everyone knows keeping Randall alive is a threat. But the fact that there is no imminent danger makes it very difficult to pull that trigger. I'd say that I'm not sure even Shane would, but we already saw him do it last week! I think since Dale WAS the moral compass of the group, someone WILL rise to fill his shoes. It's definitely an important voice to be heard on this show. Otherwise it's just any other Zombie show where it's kill or be killed. They want to stress the HUMAN side of things on this show. At least, that's what I assume. 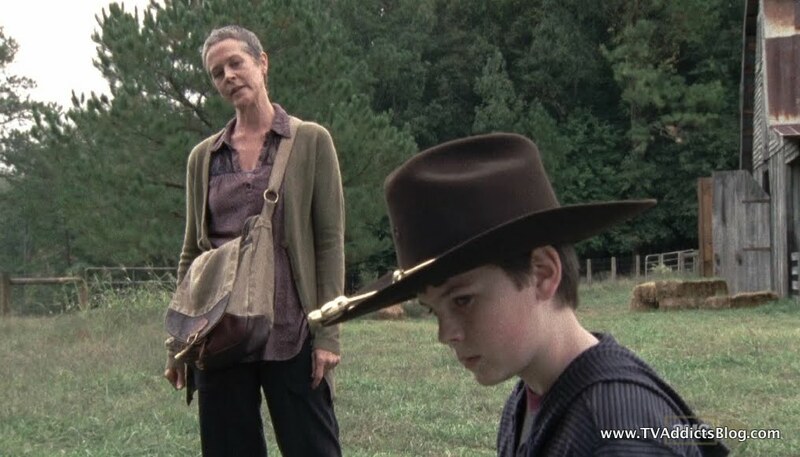 I saw a clip from next week's ep on TALKING DEAD so I don't want to comment on your carl observations. lol But I agree, definitely important questions to be asking! Thanks for the props MJ and good luck with Alcatraz! I didn’t see this one coming either, but at first, I was afraid that Dale was going to give up and kill himself because he couldn’t deal with them losing their humanity. 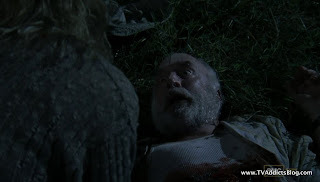 That was some kind of intense and gross scene for poor Dale! Kinda makes you understand where Beth was coming from wanting to end things her way. And, why was she just laying in bed again? I thought she was back on her feet. 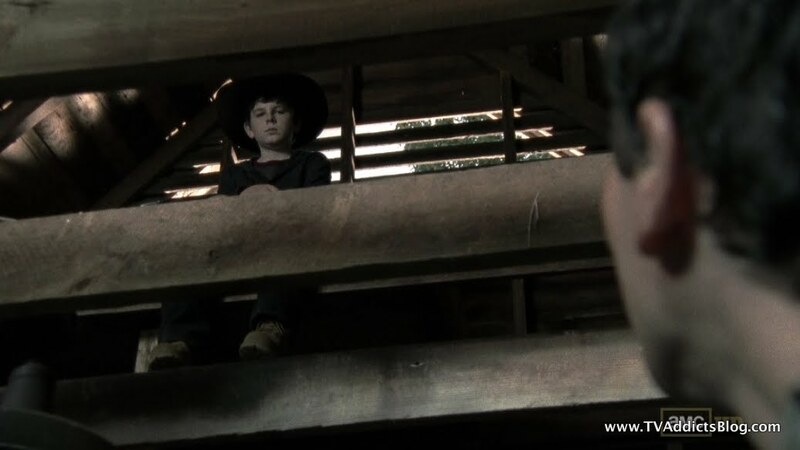 Carl was CREEPY when he went in and was staring down the prisoner! I thought he might just pull out a gun then! He looked like he was out for blood, and again when he came back in hoping to see his dad kill Randall. 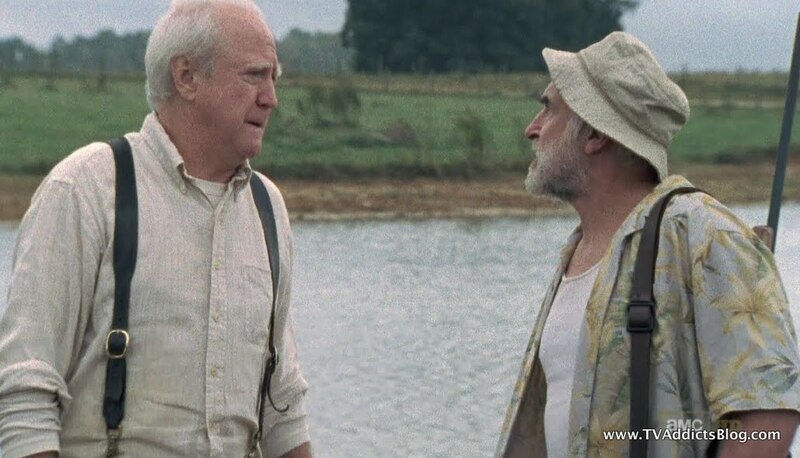 Then, when he started taunting that walker, I knew it wasn’t gonna end well, but I never would have guessed that Dale would be the one who suffered! 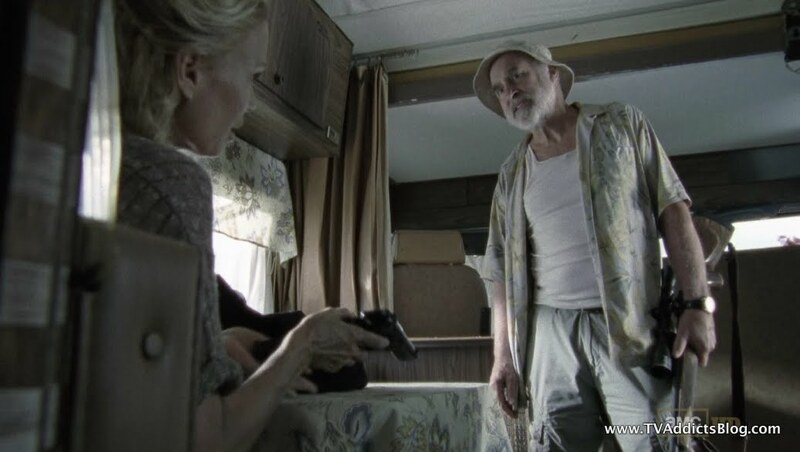 For a second, I felt bad for Carl when he realized it was his walker that got to Dale because I think that’s gonna haunt him. That was a sweet moment between Hershel and Glenn. Before Andrea sided with Dale, I loved how she said it’s not like they could put Randall in irons and sentence him to hard labor. THAT was distasteful to her, but killing him . . . no problem! I also caught that Andrea was a civil rights lawyer which I didn’t remember them telling us before. Interesting, considering the path she’s gone down. And, Carol didn’t want to be a part of the decision at all saying she didn’t sign up for this. No kidding! None of them did! I saw that about Alcatraz, too. Weird that they wouldn’t just push the episodes back a week and still show them in order. 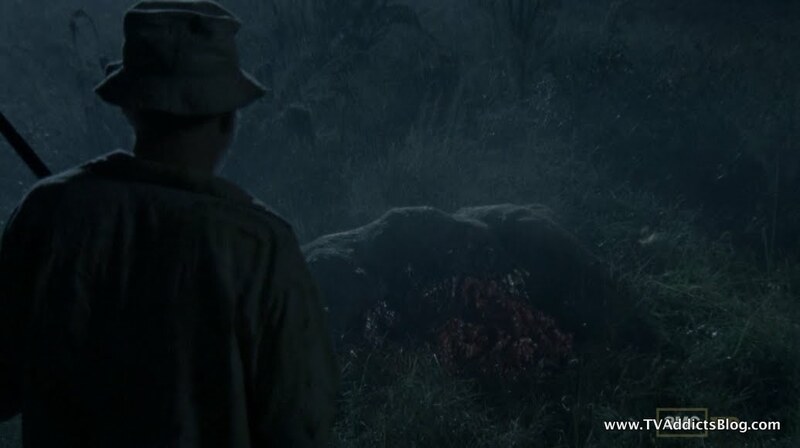 Oh yeah...I'm sure we were supposed to have mixed feelings for Carl in this situation...but damn...what an idiot!! lol Apparently, his arc in the comics is similar to what is starting to play out here. (behavior-wise)....should be interesting to see where they go with it! Yeah, we saw Shane putting the bullets in the SUV just before Dale walked up to him for their talk. Maybe he was just setting up a personal stash. 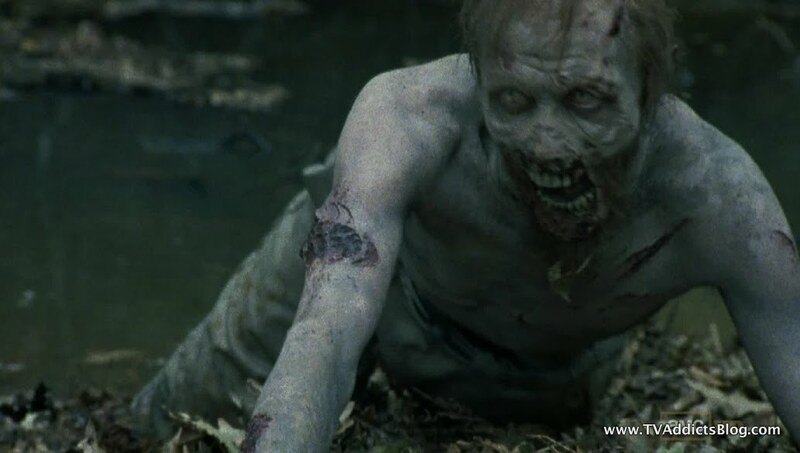 It's funny how brave Carl got when he saw the walker's feet were stuck in the mud. 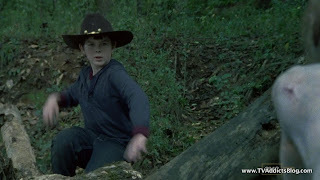 I'm hoping that Carl will back down from his need to kill or whatever after he saw what happened with Dale. Maybe he'll get a dose of perspective that actions have consequences, and you may not like them. Yup...watched ONCE! It was a good one. Loved the "origin of Grumpy"! lol Also loved that the rest of the dwarfs looked like their disney counterparts. lol And liked how they tied Belle into things too. The show really seems to be finding its niche. I'm enjoying it! And, I like how they tied the light together in both lands...Leroy fixing the light for Astrid, and the dwarfs mining the diamonds that turns into the fairy dust that lights the world. Once is another show I credit your blog for my watching. (Kind of the opposite of TWD! lol) I recorded it, but didn't start watching until I saw all the comments on here. I'm not a Games of Throne watcher, but saw that Mad Men will have a 2 hour premiere. Definitely looking forward to that! I am glad that there are some people that fund us all veering off topic as beneficial to learn about some shows out there. I know there's no way I could write about them all so that's good to know! And glad you found the show because of it! ONCE is one that I like to take credit being an advocate for it early on when the critics thought it looked awful! I loved the concept, and I loved the writers attached to it. BTW...42 Candles sold last year was an intentional LOST reference according to Eddie and Adam (showrunners). They announced at Paleyfest last night (which I got updated about via Twitter..just sayin) that there would be a cryptic LOST reference and it revolved around candles. Good times. Oh, I didn't catch the LOST reference with the 42 candles! Love it! Mad Men doesn't start until the 25th. I don't watch Shameless (don't have that channel), so no conflict for me. As usual, I'm a little late catching up here! I could tell from your recap that you were just about as aggravated with Carl as I was! What happened to the sweet little boy we saw just a few weeks ago? 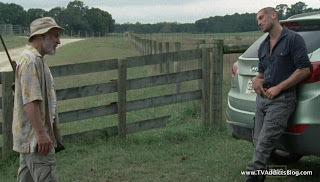 I guess the shooting of all of the walkers in the barn, including Sophia, just sent him over the edge. I could not believe the way he was taunting the walker who was stuck in the mud. I was literally on the edge of my chair! I couldn't decide what would happen first, the walker getting lose, or another walker coming along because Carl wasn't paying attention! Sad about Dale, but he really didn't belong in this new world. He would never survived without a "kill or be killed" attitude. I totally agree that Randall had to be killed to protect the group. He most certainly would have returned to his people if set free, and even if he didn't want to, they would have forced him to tell them where he was and what the situation was there. Also, thanks Mike, for identifying him as being on Rescue Me! I knew he looked familiar, but the accent was throwing me off! I thought this was an excellent episode! Wonder what Bow-and-Arrow guy (can't think of his name) is going to do when he notices his gun is gone! Everyone is changing so much. Did you notice how vocal and angry Sophia's mom was? She would never have spoken out like that in the beginning of the series, too beaten down by life and hubby to make a sound. Not that I blame her, I'm just saying, I think all of the stress is taking it's toll on all of our characters! I'm not sure I agree with the statements that Dale is THE moral compass of the group. I definitely think Rick and Glenn are highly ethical and sensitive individuals, as well as Hershal. I did not see the part y'all are talking about with Shane putting stuff in the back of his SUV. I have been watching Once Upon a Time and while it is not the greatest show ever, I do enjoy the way they are mixing well-known fairy tales with the present day stories. Very creative! I like Alcatraz for the same reason, mixing the past with the present. Also almost finished season one of Game of Thrones, and started watching Season 3 of Sons of Anarchy (great show!) Cannot WAIT for MadMen to start up again! @Cajun, never too late to provide commentary! Glad you did! Interesting question about what made Carl all of a sudden so crazy. 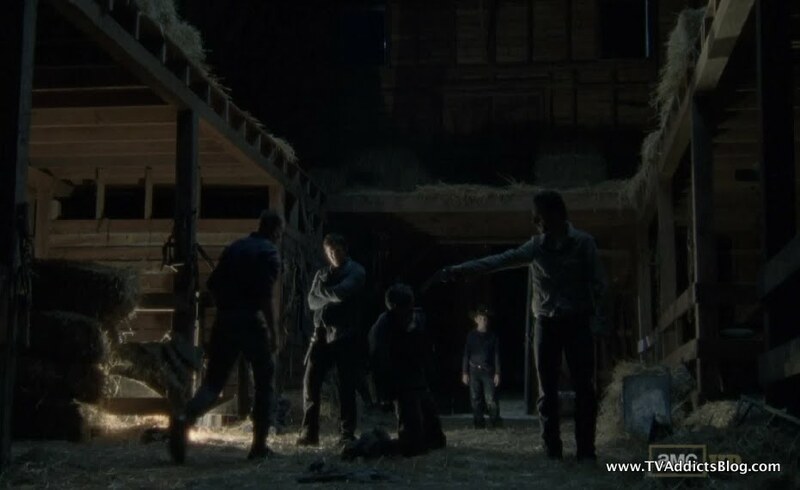 I think there were some earlier scenes this season with Shane where he wanted to teach him how to use a gun and all of that fun stuff. 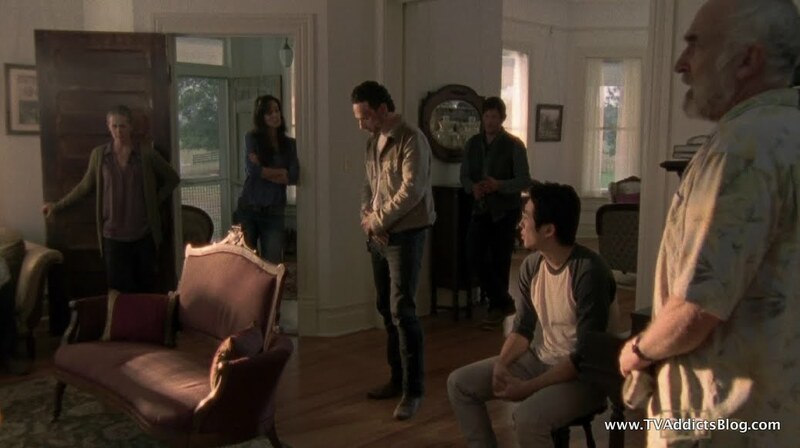 Lori was being protective over Carl and Shane was trying to win him over. I may be making some of that stuff up. 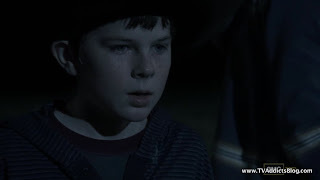 But I definitely think something happened PRIOR to the barn shooting that got Carl starting to look at things differently. In any case, yes he's super aggravating! Agreed, the characters are definitely evolving (for the better or for the worse or both). Definitely noticed Carol's change. 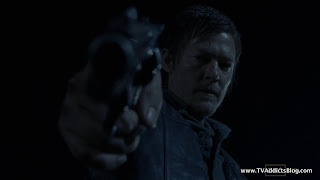 INteresting thought that Daryl may start wondering where his gun is and then possibly it will be revealed what led to Dale's death. Don't know if they'll explore that or not! Rick and Glenn are definitely pretty sensitive, but even both of them agreed on killing a living person. 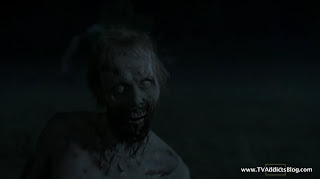 Say what you want about the zombie apocalypse and survival instincts....that is certainly not the MORAL thing to do! I still don't recall the SUV thing either, but I'm not sure it's entirely important what he was doing there. Guess we'll find out in the next couple eps! Awesome to hear you're catching up on some great television! I'm sure some of us here will be discussing GoT and Mad Men. (Definitely SOA S4 in the fall) My problem with GoT is that I am reading the books ahead of the airing of the show...so I have to be careful with what I say! :-) I just read some really meaty stuff today which will be towards the end of season 2 I'm guessing. It's good stuff!